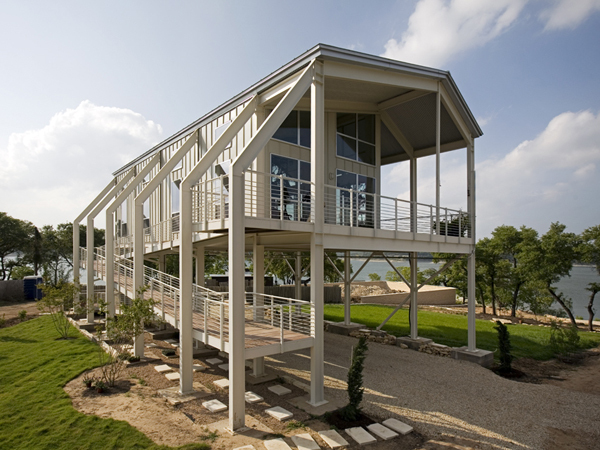 Building a home in a low-lying area close to Lake Travis’ waterfront was no easy task. Floodplain regulations mandate structures near the lake be built at the spillway height, so the 1,650 sf residence had to be designed to stand on 20 foot stilts. Furthermore, the stilts and the residence had to withstand harsh, varying angled updrafts that are created from the lake having temperature differentials and the water not moving in the same direction. 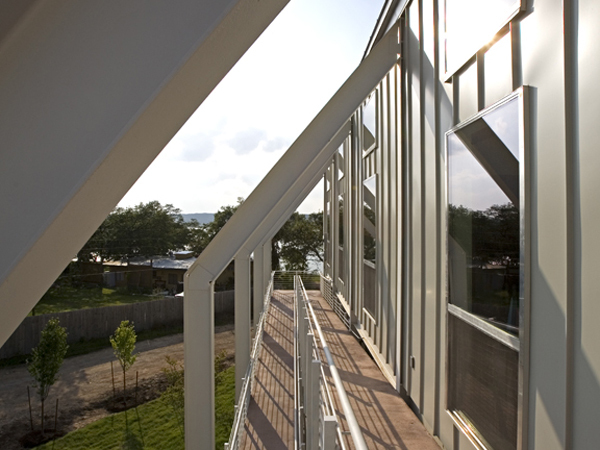 The metal stilts that extend into strong frames, form columns on either side of the building; a lighter metal frame between the main columns supports the roof, ceiling and floor and an exterior switchback ramp provides flexibility in accessing the residence. Windows on two sides of the house open the interior to the lake, while Galvalume, Kynar finished, standing-seam metal roof and siding complete the exterior. In order to prevent thermal transfer from the roof, two roof decks separated by a ¾ inch air space above the insulation where used.